In February of 2004, as a birthday present for my then Girlfriend (now wife), I organized a joint gift from all her friends so that we all donated money to a large gift. In this case, it was a CobaltFlux DDR pad. They were, and are, the best home dance pads for DDR/Stepmania you can get. They take a few weeks to build, and are all built to order, so a few weeks later, I got the pad. The pad is pretty cool, and still works great after over 5 and a half years. However, I have never been overly happy with the control box (the thing that takes the input from the DDR pad, and translates it into something a PSx can understand. Then there’s the whole getting the PSx output to something you can use in Stepmania. Luckily, I was able to purchase the best converter box ever produced before the company went out of business (I think that’s what happened), the PS Joy, made by Boom (picture on the right). 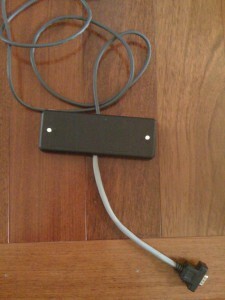 It is just a little converter box that has a female USB-B connector on one side, and a female PSx connector on the other. The games don’t need any tweaking, it just works. Or at least it did, until about 3 weeks ago. 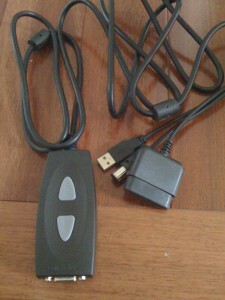 So, 3 weeks ago, my wife goes to play DDR, and the pad doesn’t work. Neither do the buttons on the control box. I fiddle around, grab a PS2 controller (which ends up working), and determine that the control box has died. So, I go online, and order the new V5 control box (after confirming that my pad does in fact have a 15pin connector). About a week goes by, and the new box shows up at my door. I have three words for what I think: “Night and Day”. This new box is more like it. Not only is it well built, but as you can see in the picture (on the left), it has a PSx output, Gamecube/Wii output, AND USB!!!! 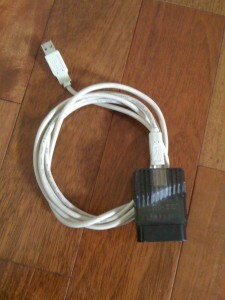 The USB is intended for PS3 compatibility (and with an adapter, “should” work on an Xbox), but it works flawlessly on a computer. Not only that, but CobaltFlux seems to have figured out that the buttons on the control box are really for hands, so lets put the box where someone can reach it without bending over. So, between the box and the pad, they include a removable 8′ 15pin male to male (basically VGA) cable. So you can put the control box up on the surface that holds the TV, and actually reach it. The new box is, from what I can tell, perfect. It’s what the box should have always been. We’ll see what time does, but all and all, I’m extremely happy, and would recommend anyone with a version 1 15-pin control box to pick up one of these, or add them to a wish list somewhere. My only complaint, and it’s not much of one, would be: It would be cool/nice if there was one or two LEDs on the controller box to signify power being received from the host device, and maybe one to indicate a button being pressed on the pad itself. This would make it a lot easier to troubleshoot issues should they arise. But, other than that, definitely a 4.9 out of 5 stars. anyways you wrote a review on your Cobalt Flux control box back in 09 (whoo) and I’d like to ask (scream) where you bought your control box/adapters.. I just got a cobalt flux and I’m sincerely lost as far as cleaning it and getting the proper cords/adapters to connect it to my pc to play stepmania. It came dirty and alone without even a manual. o.o As far as I can tell mine also has the 15 pin female cord sticking out of the mat. I feel desperate – I’m willing to even pay for any help you can give me. That said, I found this article: http://www.pnwbemani.net/bemani-discussion/building-a-diy-cobalt-flux-control-box/ That looks like it should work. There’s also a post here: http://community.us.playstation.com/t5/Dance-Dance-Revolution/Best-DDR-Pads-for-PS3-Including-DIY-Bluetooth-Dance-Pad/td-p/36226922 about making one with an old PS3 sixaxis controller. I might actually try this myself (I have 3 that I don’t use). The only other option I see would be contacting the people here: http://www.ddrgame.com/dance-dance-revolution-control-box-4-in-1-blue.html and see if they know how to use one of their boxes with a CF pad. It SHOULD be possible since you’re just making connections when you step on the buttons, it’s just a matter of pin out. Should be able to just make a cable to go between the box, and the CF pad to move pins around. Here’s someone that’s converted one of the boxes I listed to work with a CF pad. Should be pretty easy enough with a few parts to make a converter cable. Let me know if you need any more help… I’m not sure your technical skill, so I don’t know if any of this is something you’d be comfortable to do. It should be easy enough to take an old male-female VGA cable, cut it, and splice the wires together following the above to make the pinout correct for that box. I guess I should have asked first, it didn’t come with any control box? Just the small cable jutting from the pad? Did this help at all? If you need more help, please let me know. I can probably help you figure out something.